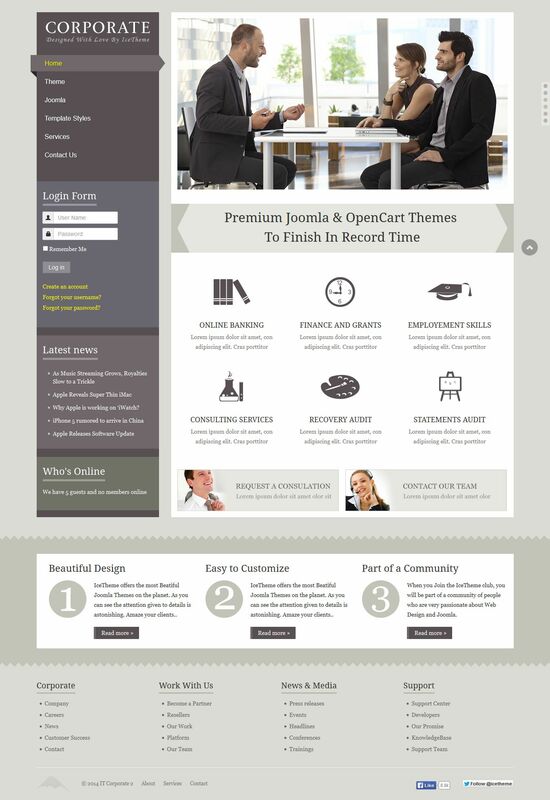 IT Corporate 2 - excellent template for business websites themes, has the support of Joomla ver. 3.x development team is IceTheme. Fashionable design template also includes six color schemes help you to create your own look to your taste. The assembly includes the latest rotator content to let you in a flexible way to display a necessary and important content on the site. Through the use of the platform Bootstrap, not without great template optimization, high download speeds and support for mobile and tablet versions. The modular design of the template will allow you to put all the elements on the site in a very flexible way. IT Corporate 2 can be regarded as an ideal solution for creating professional websites in accordance with modern requirements.